The oldest memory I have is of catching a baseball. Coming from a sports fan, this may sound like treacly, lump-in-your-throat stuff, but it's true. I was three years old. My father was mowing one side of our front lawn, I was standing in the other, and I underhanded a pop fly into the air. It hung up there forever and I got dizzy trying to follow it. When the ball smacked into my hands, I had no idea how I'd caught it. Thirty-seven years later, I'm sitting on a suede easy chair recreating that moment in MLB 13 The Show. Not necessarily in a good way, either. Don't get me wrong, The Show's latest release still places it in the top echelon of sports gaming. But its improvements are mostly subtle, which is to be expected of an annual sports release near the end of a console life cycle, especially one made by a company that just announced the next piece of hardware. Some of its more overt changes are head-scratching, if not off-putting. Let's start with Road to the Show, a very popular career mode that indulges your superstar fantasy, and a bulletproof feature every year since its introduction. MLB 13 The Show introduces a new camera perspective for both hitting and fielding, but I'm not sure what it adds to the experience. If you hit or catch a lot of fly balls, prepare to spend a lot of time staring up. In fielding, you're now following the flight of a fly ball, visually, as you respond to an onscreen icon telling you where to move your player. For high pop flies, even to the warning track, there's almost no way where to judge where you are in the field—that's why there's a warning track, after all, the crunch of clay under your cleats lets you know, hey, you're close to the wall. Not that single-player fielding was a breeze in MLB 12 The Show—taking good routes to corral a shot in the gap is a little easier in MLB 13 thanks to the new onscreen indicator. But in Road to the Show, the new fielding view makes a high fly ball—especially one in which you have to range back—an adventure. This, plus the continued lack of a fielding minigame to acclimate yourself to these responsibilities—your only means of learning is to go out there in a live performance—means your debut month is going to be filled with needless mistakes that a professional ballplayer, of any caliber, simply wouldn't make. In batting, you will also follow the flight of the ball, with it centered on your screen (unless you hold a shoulder button to keep your eyes on a base coach). Longtime fans know why a ballclub's comp seats are directly behind home plate—they offer the poorest perspective on the flight of the ball. In Denver I'd go to Rockies games and laugh at the minivan crowd from Douglas County sitting behind home, shouting at anything hit in the air. In The Show, I've hit towering flies that I thought for sure were over a fielder's head, only to see one trotting in to pull it down. I've chopped them to the opposite field, expecting to be caught out, and seen the ball sail into the corner or even over the fence—which has its own consequence as effective baserunning always requires thinking a step ahead. WHY: When the history of the PS3 is written, MLB The Show will be recognized as the console's most consistently excellent title. What I played: Two rookie campaigns in Road to the Show (pitcher and hitter) and an entire postseason. Four games played online day of release. Hitting is easier, which reduces stress offline, and makes online play much more enjoyable. Just a beautiful game, richly illustrating one of the best sports fantasies money can buy. Some changes to Road to the Show presentation seem needless and invasive. Despite a new "Beginner" mode, you're still on your own learning essential acts like baserunning (team) and fielding (Road to the Show). "Still the finest in the field." "Brings back the terror of tracking down a towering fly ball in Little League." "This is a game for all America. A game for boys and for men." The new camera view is a mandate of a more personalized focus in Road to the Show, not that last year's was, really, wanting for intimacy. Before the game, the commentary booth will remark specifically on your career, the milestones you reach, and the expectations set before you. (If you miss a promotion to AAA or the majors, they'll bring it up.) 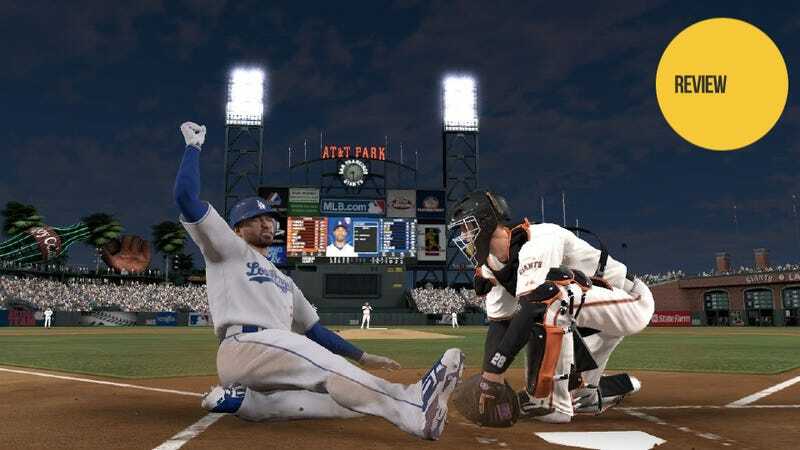 RTTS, which for many is the only mode they will play in the game (it is for me), removes the player from the broadcast presentation and depicts him more in the mode of playing the game. In some areas, the execution is fantastic. Your base coach yells situation-specific instructions at you. Infield chatter is authentic to the ball-strike count and number of outs. It's more than window-dressing, it's actionable information. During a game in MLB 13's Road to the Show, however, the regular broadcast audio is gone. You only hear commentary after the end of a meaningful play. Yes, I know real baseball players don't hear what the guys in the booth are saying as they play. But every 12-year-old who fantasizes about hitting a game winning home run also mimics the radio call as he does so. The inclusion of TV audio—or a camera view of your hit—doesn't shatter immersion. What does is the distracting whoosh noise you get as you either enter or leave your player's head to hear on-field sounds or a deliberately tinny broadcast commentary. In many cases, the audio doesn't kick in soon enough, and is cut off mid-sentence when you return to play. It even slows the game down relative to MLB 12 The Show's RTTS. If you're a veteran player 10 seasons into an RTTS career under MLB 12 The Show, you already know how to hit in this game, and probably won't feel much of an urge to start all over again in MLB 13 on Day One. That's for a single mode of play, however, and my disappointments in The Show are almost entirely limited to it. There still is palpable improvement in two critical areas elsewhere in the game: Its online play, and in hitting. Online play has long been a bugaboo for The Show, especially for a game so dependent on timing (or defeating it, as a pitcher). In the online games played I played opening night, I've never had the feeling that my hitting was thrown off by input lag. I doubt The Show rewrote its codebase and hit it perfectly on the first try; it's more likely that opening the hitting window—the time in which you can make effective contact on the ball—helped move online play into a more enjoyable state. The flipside is, playing casually, you're going to see a lot of slugfests. While shooting the bull with a friend, we traded eight-run innings. That said, the huge totals were totally the fault of my lack of attention. The home runs I hit (or surrendered) came in authentic situations, and swinging for the fences on every pitch with Jason Heyward still got me five strikeouts with him in a game. In offline play, experienced Show players may find themselves bumping hitting difficulty up to All-Star or higher soon into their Franchise or RTTS careers. Hits are very easy to come by at lower difficulties, but that's fine with me. In past iterations of The Show, I played a lot of station-to-station baseball, grateful for any hit or one-run advantage. The opening of the hitting timing window means you don't have to approach every situation with a man on base like it's your last. You can stand in there, be selective, and wait for the pitch you prefer to hit. There's a new fielding system as well, something called "Button Accuracy" which combines a throwing meter (for accuracy of the throw) with how hard you jam on the button of the base you're going to. It takes some getting used to, and in my first few games I was pulling a lot of guys off the bag with what should be routine throws. Still, Button Accuracy does make the business of scooping out ground balls and turning double plays into more of a deterministic exercise than past versions of The Show (or other baseball games, in general.) It gives worthy attention to fielding, the second-most unloved phase of the game (next to baserunning). But if you don't prefer it, The Show lets you employ older control methods. That is, somewhat secretly, the greatest strength to this series: The endless customization of the controls and the means that offers to challenge your true strengths (mine is pitching) while minimizing your weaknesses (fielding and baserunning). No other game offers this level of assistance without making you feel like you're cheating or ignoring a critical phase of play. To this, Sony's San Diego Studio added a "Beginner Mode" that I've already sampled, and anyone with more than a year's history on The Show won't need to spend much time with it. It's not so much a tutorial as it is a difficulty (or lack thereof) setting, applicable to any game mode. It only trains you up in pitching and hitting however; this is a game that could seriously use instruction in baserunning and fielding, acts that are taken for granted but mystifying to a newcomer once the ball is in play. As always, MLB The Show is one of the most beautiful video games—sports or otherwise—period. NBA 2K is a close rival in the genre, but even it has quirks—in the way tank-top jerseys hang, for example—and is a sport played inside an enclosed arena. The Show presents a game principally in outdoor lighting with impeccable quality throughout. There isn't a flat or unnaturally low-contrast surface on any part of the screen, even during a night game. The crowd, one of the atmospheric features everyone loves to bring up when discussing next generation hardware, is alive, interesting and distinct. You really see it in the game's postseason presentation, which you can jump to in a new tournament mode without having to wade or sim through an entire Franchise season. When I ponder how the next console generation could possibly make a game's graphics more stunning, MLB 13 The Show on the PlayStation 3 is the first thing I think of, because Christ almighty, no other sports video game, every year, is this good looking. Yes, a lot of MLB 13 The Show's quality is banked on the excellence that preceded it. It's no bold leap forward, which should be expected as we come to the close of this console generation. Its peers in the sports genre—FIFA, NHL and NBA 2K—likewise took few risks in their most recent releases. These are the supermodels of sports video gaming: visually stunning, impeccably manicured, desired by the public and envied by their peers, and if they have recognizable flaws or grating annoyances, they're overwhelmed by beauty and sophistication. But I'm struck by how I can still fall in love every year with a game so dependent on such repetitive acts spread out over a 162-game season. I will always, always love watching the cleanup hitter pivot slightly, check his swing, and see my 1-2 slider drift across the plate like an extinction-level asteroid in a near-earth trajectory. Every sports video game has its moments. In MLB The Show, they are memories.